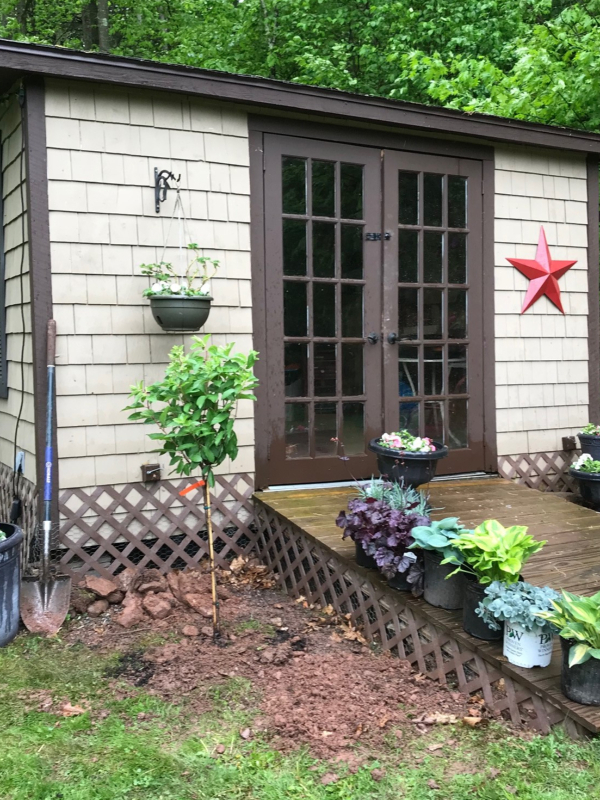 MountainMama: The Garden Cottage Got A Big Facelift! By now you know how obsessed I am with my little garden cottage. In my last post I showed you the most recent upgrade, the lattice around the base. Which made her look prettier, but NOTHING like what I did this past weekend! Are you ready for it? Are you? Look at her now!!!! I just want to break into song....."Isn't she lovely.....Isn't she wonderful...."
Those of you who follow me on Instagram got a sneak peek over the weekend so this is hardly news to you. I'm just so darned proud of how she looks now compared to the first day I opened those doors and fell through the floor! This was a tough project and I'm still sore from it, 4 days later. I started by placing the tree in the pot in the area I was picturing it growing, and moving it around until it felt and looked 'right' to me. Then I got out my biggest shovel and started the back breaking work of digging a hole in my clay soil. Do you see all those big rocks at the side? Those came out of that hole. I wasn't kidding when I told you what a nightmare it is to dig a hole up here on the mountain top! 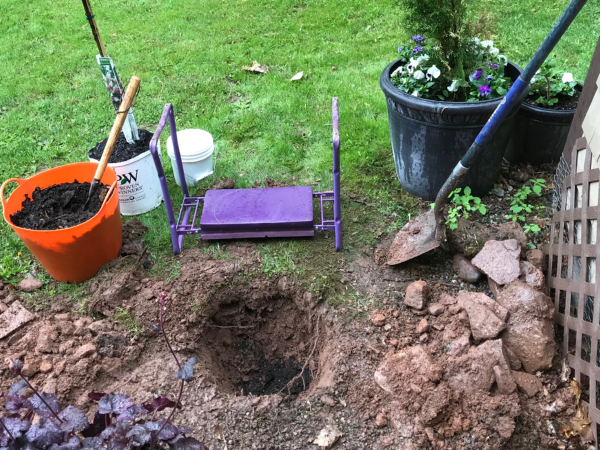 The orange bucket was filled with compost from my compost maker - I put some in the bottom of the hole, mixed it with Energy Buttons from Gardener's Supply, and filled in around the tree with the rest of the compost. Then I took a break for a few minutes and figured out where the rest of the plants were going. I wanted something that would have interest all season, even when not flowering. 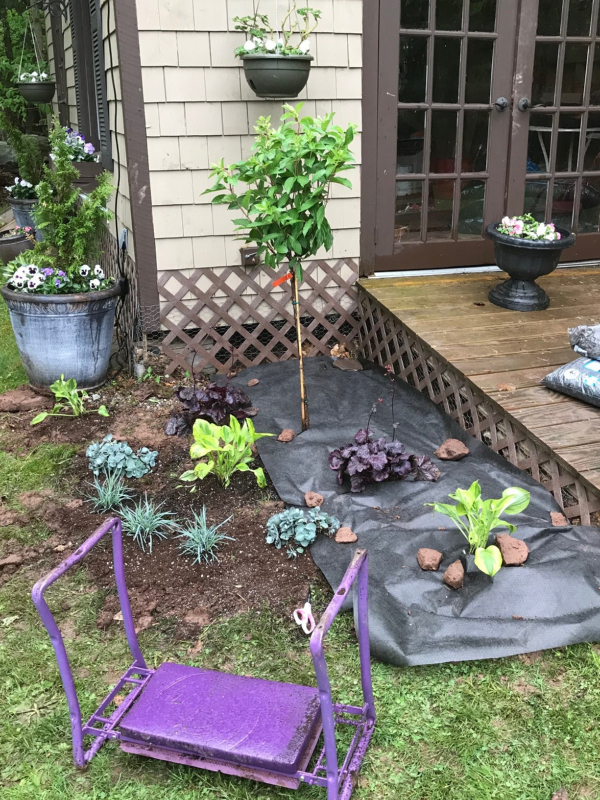 I'm a huge fan of contrasting foliage, so that was the way I went with this garden. Also, I wanted something that was mounded, not something that spread. A neater, more manicured look than some of my other gardens. 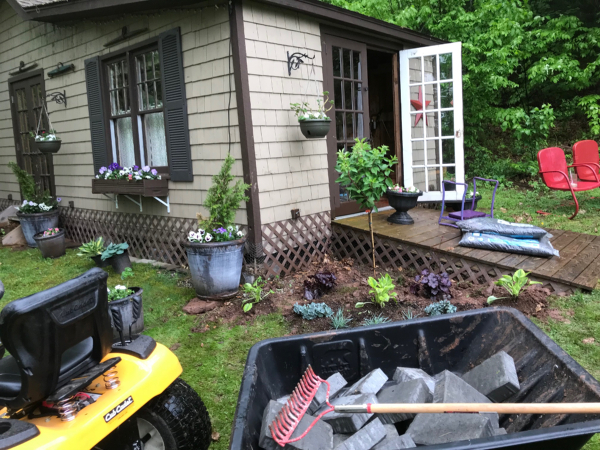 Almost done with the planting and the pile of rocks is growing! Look at how those colors play off one another - just gorgeous! The plants are all in, so me and Bee headed off to the pallet of paving stones to grab a bunch for the edging. Before we did that, I loaded up the trailer with those big rocks and took them to the edge of the woods to dump them. Did I mention how very much I love Bee? She may very well possibly be my new best friend! Sweetie says she's his competition. No way, Sweetie! Now it was time for the weed barrier. I used some of the smaller rocks I dug out of the holes to keep it in place while I cut it with scissors and worked it around the base of the plants. Not the easiest task, but certainly much easier than digging holes or pulling weeds! This little purple kneeler/bench is another one of my gardening best friends. It flips over to become a stool, or can be used as a kneeler - and the 'legs' become support to get back up after you've been kneeling. Anything that helps this old lady out in the garden is most welcome at my home! I wanted a curved bed to counter all the sharp corners and straight lines. Time for mulch! Oh my gosh isn't it just the most amazing improvement? I do plan on continuing the bed across (under the window box) and ending it at the stairs to the other french doors. But I was out of steam. I had nothing left. This was a very, very tough, back breaking project. I have two Hostas left that I will split and plant in the other portion of the bed. Whenever my sore body is ready to tackle those holes. But for now I am just so pleased with how beautiful my little garden cottage looks! 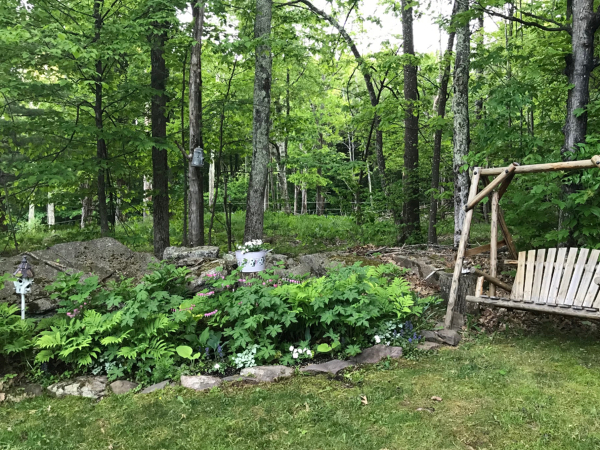 You can see the 'wild' garden to the left of the swing in this photo - it sure is a lot different than the manicured bed I just put in! It's full of native ferns, and it's the site where the previous owners used to dump pots and old plants....which is exactly why I decided it would be perfect for a wild garden - the soil had already been composting for years! It was full of leaves and loamy rich soil....and roots, and rocks of course! Now it's also full of Peonies, Bleeding Hearts, Hostas, Foxgloves, Dead Nettle, Ajuga, and these lovely Lily of the Valleys. The Peonies are getting ready to bloom for the first time since I planted them which is super exciting. 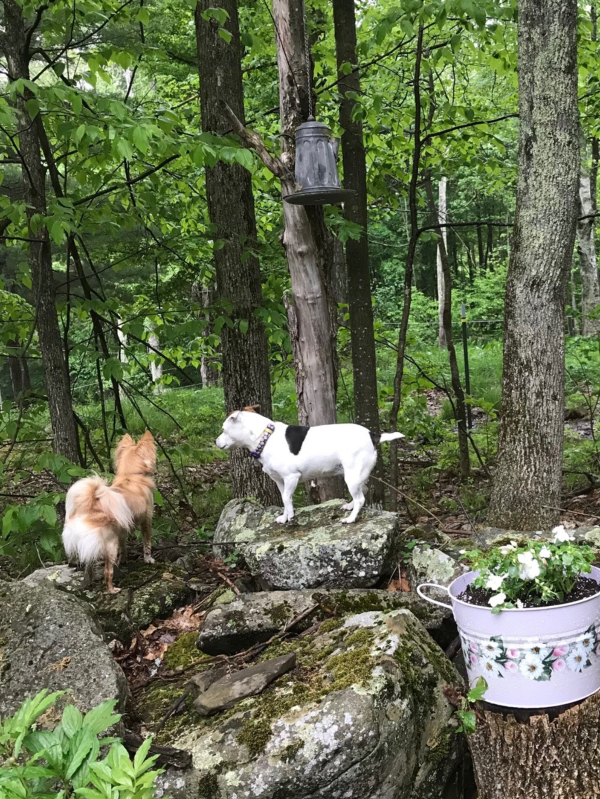 I found this sweet metal bucket at a garage sale over the weekend for $5 - I drilled holes in it and planted it with Impatiens and I knew it would be perfect on the stump in my wild garden. On the other side of my garden cottage is the lovely Lilac I showed you in my last post, the one from my parents. It's not very full yet, but it did have quite a few blooms this year, and they were spectacular! 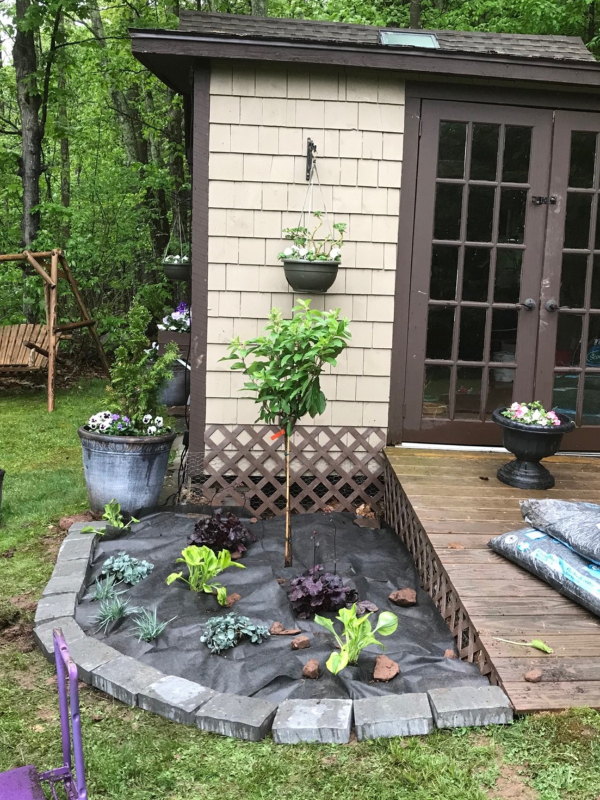 The Hydrangea Tree I ordered from The Planting Tree arrived in TWO days with free shipping, and was packed so amazingly well and in fantastic condition! I'm so pleased with my order from them, and will keep them in mind in the future for certain. It's already got buds on it, so I will be enjoying flowers in its very first season - that's exciting! I'm so delighted with the view out my bedroom window now, it pleases me to no end. That's the life of a gardener, enjoying the simple pleasures. Meanwhile where were my helpers when I was breaking my back creating a new garden bed? Little crackpots think they are billy goats or something!!! Beautiful!! I was thinking about your lovely little cottage this weekend. My pool cabana needs an overhaul and I like your style! I'd love to see what you do with your pool cabana, Kim - you are so creative no doubt it will be awesome! Wow, what a difference. It looks fantastic. And, I love your wild garden too. Lily of the Valley is my dad's favorite and my Granny always had a bleeding heart plant. Need to look into those. 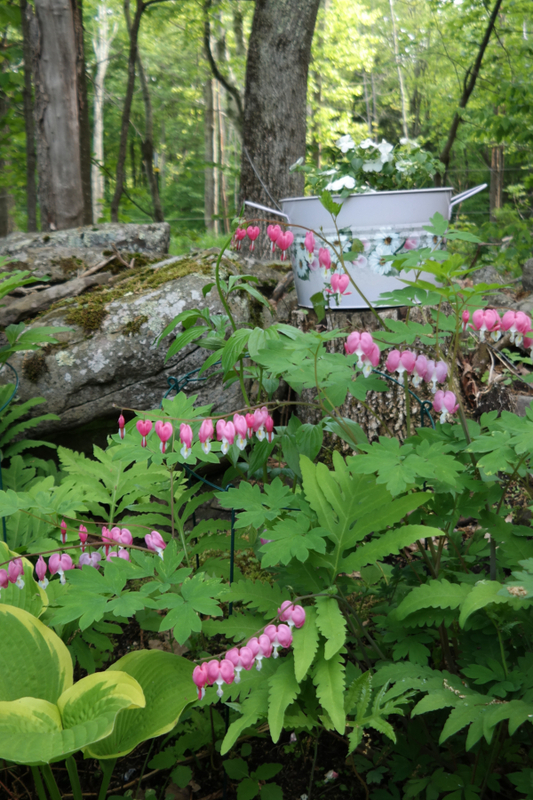 I had Bleeding Hearts at my marital home, and I adored them so they were high on my list when I bought this house - they are so happy in that little wild garden! 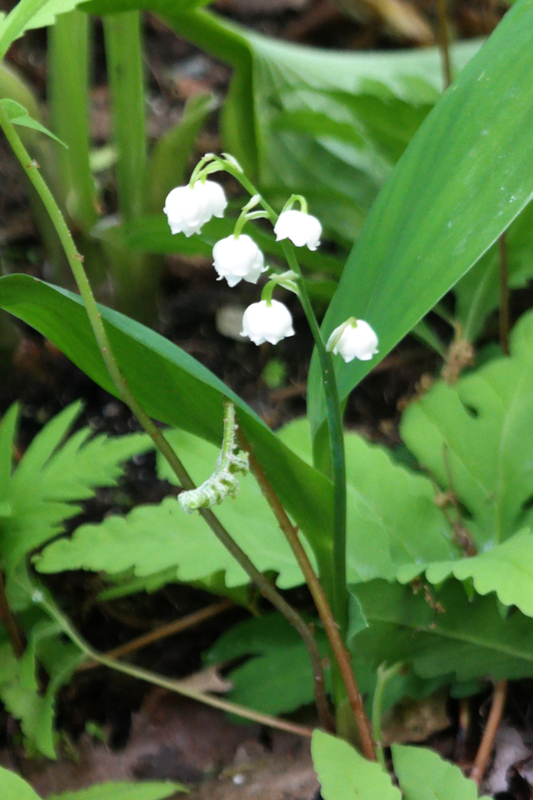 The Lily of the Valley is supposed to be invasive, but it certainly doesn't seem to be.....I planted about 10 of them and only see two! This is what my husband wants to do, around his rhubarb. Only using cut cardboard. Covering with mulch. No weeds!!!!! You did a wonderful job, with the digging (!!! 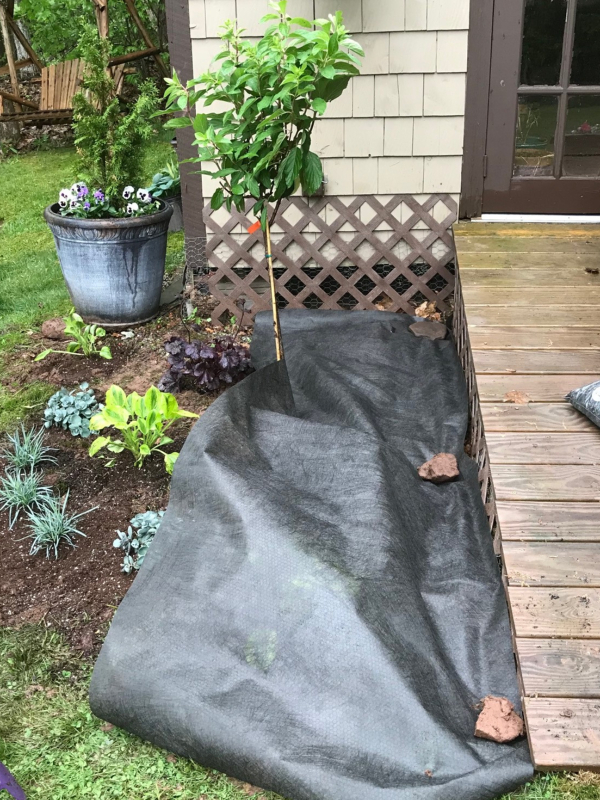 ), weed barrier, and mulch, and edging. Sooooo neat. And the colors are lovely. We have one of those kneeling and stool things too!!! They are wonderful!!!! I did the cardboard thing in another bed shortly after I moved here...used a bunch of the moving boxes which came in handy! I thought about doing that in this bed also but since I had a roll of weed barrier already I went ahead and just used it. She's a beauty for sure. I want one now so bad. I love how you planted around it and made it so inviting and cozy. I love the doggies there too. They will keep a watch on the place. They look like they are doing it now in your picture. I think the doggies were barking at the horses next door, Betsy! Little Miss Molly thinks she owns the universe, that little rascal! Our weather has been like July / August but the rains have been like spring. So weeds and grass growing like mad and high temps sucking the life out of you. It's been hot and sticky, Deb - definitely not our typical weather for this time of year! The mayflies have been awful, too....lots of bug spray needed this year. Oh wow, it looks amazing. Thanks, Marty! Hopefully I'll get it finished this weekend, if the weather cooperates. Thanks, Karen Ann! When all the flowers fill in it will be just lovely - I love the pop of white against the brown of the garden cottage! I love watching how you decorate your outdoor spaces! You are giving me so many ideas for my future gardens. I love the way you are using different foliage colors and textures...so beautiful! Our soil is also full of rocks and red, red clay, so I know exactly what you are going through to dig a simple hole. But you did it and it looks absolutely wonderful! May I suggest RAISED BEDS at your new house, Vickie? I think Tasha Tudor was on to something!! I can't tell you how much I love this and can relate to the work involved! It really looks beautiful, and knowing you did it all - isn't that so satisfying? Better endorphins than any gym can deliver, IMO. And those rocks - whew! I actually tackled the other side this past week while I was home planning Dad's funeral. This is his garden, which was part of the plan when I was making it...I can sit in the swing and feel him close to me. Oh! It looks so wonderful! I just love it. You did a GREAT job and it's going to keep growing and giving you much pleasure through the years. Gardening is hard work at times, but oh so rewarding. You are so right about that, Lorraine! You and I are so much alike! At least before i had my recent surgery. I'm going to have to wait this summer out before I can start digging...but I can give orders! lol! I love a manicured garden in certain places, others I really love a wild and free look. You really worked hard and did a great job on this project. I haven't followed you long enough to see inside your little shed. Is it your own special place? I have one, too, and longtime followers have seen it. I'll have to toss some pics into my next post, although I'm still cleaning it up. 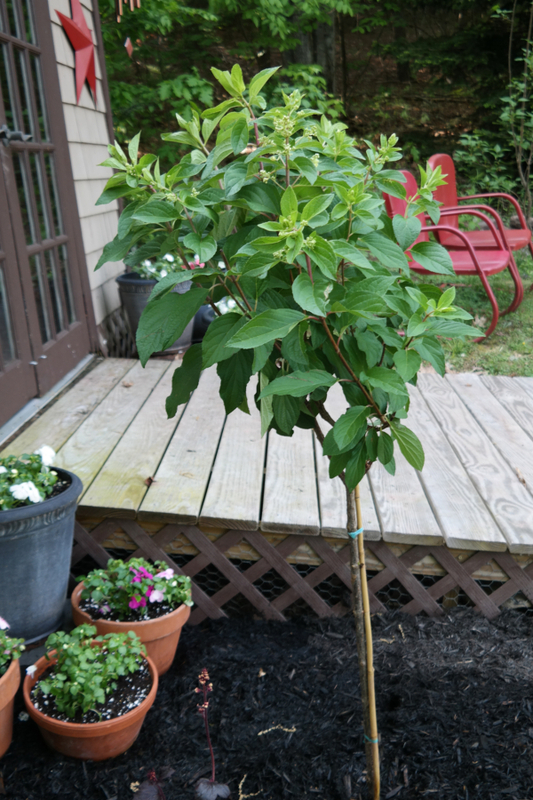 I'm going to check out the link for your hydrangea tree, it looks healthy and I can't wait to see it bloom! The interior is really a workhorse, Jane, and it needs a serious tidying up at this point! I always say that's a rainy day project....I'll get to it at some point, but not while the sun is shining and there's work to be done outside! It's super cute isn't it, Nancy? $5 at a yard sale, how could I pass that up? Im a bit obsessed with that cottage too. But those red chairs though!!! Oh my. I have been on the lookout around here for an unwanted set I can adopt. Its all looking pretty!!! They were here when I bought the house, Lisa - they were a MESS! Sweetie had them sandblasted and painted by some guy he knows...he's so good to me! He knew I was pretty enamored with them even in their sad state...they remind me of my childhood! Perhaps you can find some on Craig's List? I absolutely love it! Goodness gracious that is ALOT OF HARD WORK but so so worth it as it is turning out so very pretty! Everything is doing so well in the new garden, settling in so nicely two weeks later - it makes me so happy to look out my bedroom or bathroom window and see this pretty garden! Beautiful, Debbie! I love everything about this, from the gorgeous flowers, the shed and those red metal chairs. 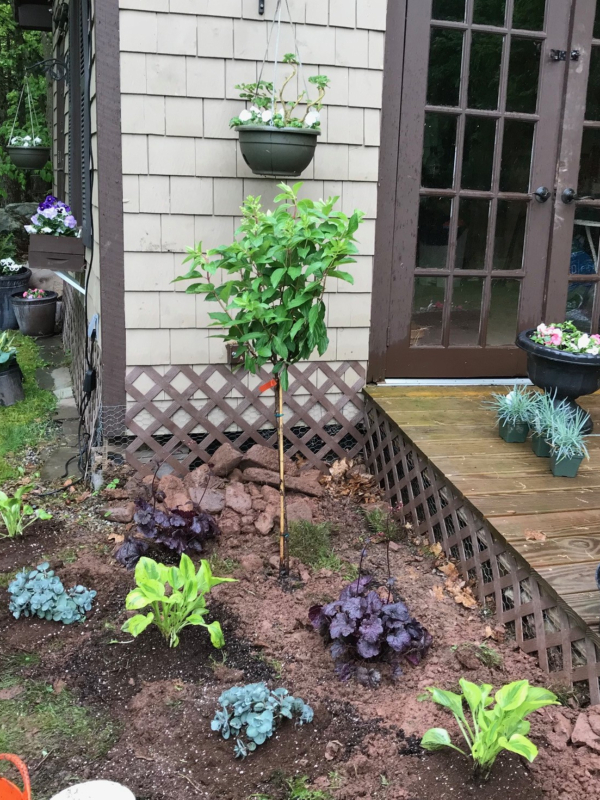 We're planting up at our cottage right now! I'm pretty much done planting for now, Carol....I think!! Although whenever I go to the farmer's market there is one vendor who sells perennial starts out of her garden for $1...I usually can't resist those! 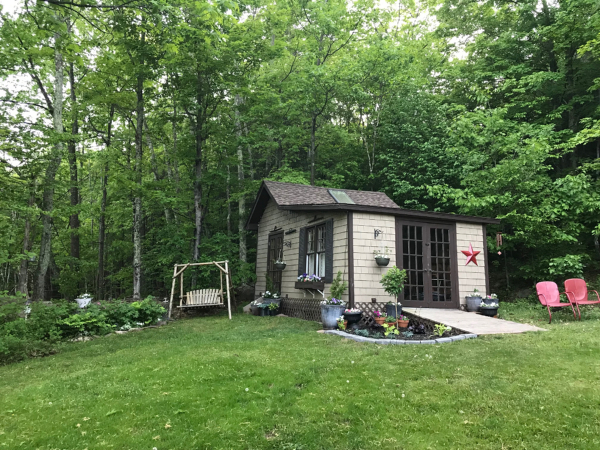 Oh Debbie: I love that little cottage. Now, I think it needs a little power, water, a bed and a shower and I will move in immediately! Your property is just gorgeous. 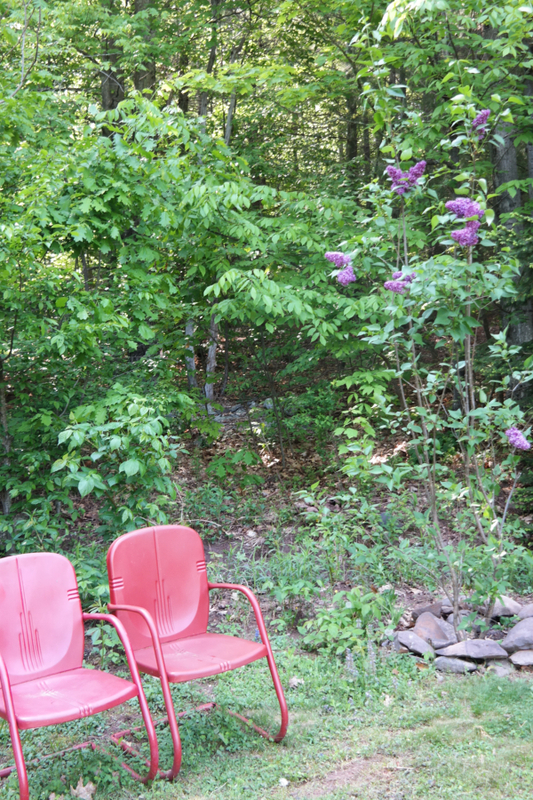 We have a gorgeous log sided home in the woods, surrounded by wild rhoddies, and boulders. Then I have a few wildly tame gardens. I love it so. I did have electric put in it when the electricians were doing something at my house, Cindy but it's a shame it has no water...or insulation. Your home sounds beautiful! You created a lovely bed! I've been trying to do some painting inside and just cleaning up the yard outside, but I find myself tiring so quickly these days. Whether it's my age or lack of exercise, I'm so discouraged at this point I don't get much done. Thanks for sharing your garden. 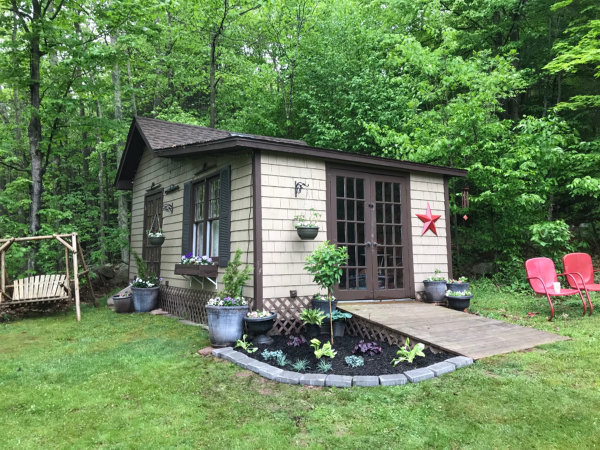 I love your little cottage and you sure did some back-breaking work in planting that beautiful garden! I can't dig a hole to save my life, much less one with all those rocks. I can only imagine how sore you are from that work. And you also must have sculpted arms! Ha ha I WISH I had sculpted arms, Melanie!!! Nope, unfortunately not. Strong, yes. Sculpted, no. However, perhaps after a summer of weed whacking they may be improved....my arms are sore for days after each weed whacking session! I was thinking of you, Deb, and hoping you are ok with the tornadoes that were in PA. Yes that clay soil...yikes it's a tough one, for sure. I prefer buying smaller plants so I can dig smaller holes, even if it takes them longer to grow to full size. Your cottage and gardens are pretty and its obvious how hard you work to make them so. The cottage is adorable and I've been working in the garden for the last week and my old body is feeling it! Gosh I remember when I could spend the whole day out there but not any more. Did you soak in a hot tub after all that hard work? I would love too but I can't get up out of the tub amymore, ugh! I did soak in a hot tub after all that work, Cathy! I used a mineral salt soak which helps soooo much after a good workout in the garden....or stacking wood. I don't use my tub that terribly often other than that as I have a well and septic to think about...but it sure is nice to have it when I need it! I can SO relate to rocky, clay soil issues! NOT fun! Your hard work paid off Deb, but you know that ;). Thanks, Doreen! Hopefully your new home will have lovely, loamy soil with no rocks!! Your hard work certainly paid off....just gorgeous! Love the combination you selected. Don't have the back for such hard work anymore which makes me sad. But I have a small perennial garden and always annuals growing in pots. Love the picture of your pups. Made me smile. 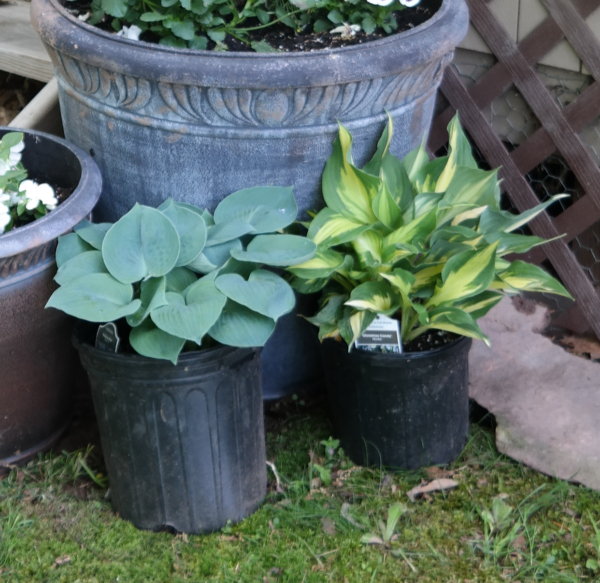 I love having a bunch of annuals in pots, Jen - and in my rental homes I had container gardens which were MUCH easier to take care of than my current garden, that's for sure! But I get such gratification out of planting things and watching them come back year after year....although I lost 5 rose bushes this winter, how sad is that? It looks phenomenal! 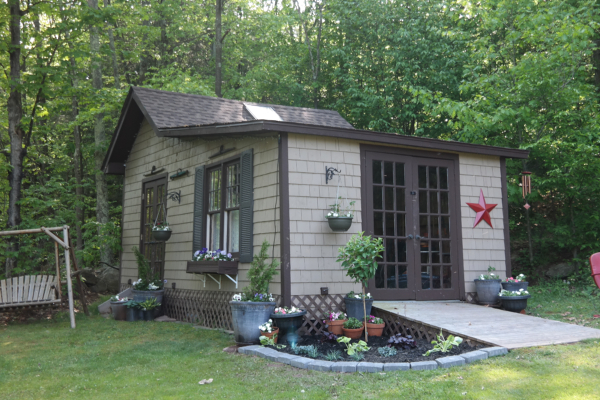 What a fabulously fun project and great little hideaway. I love your blue hosta. I had a giant one of those at my old house that was lost when a tornado uprooted the 100-year-old red bud tree around which it was planted, and left us with a small pond. I was crushed. 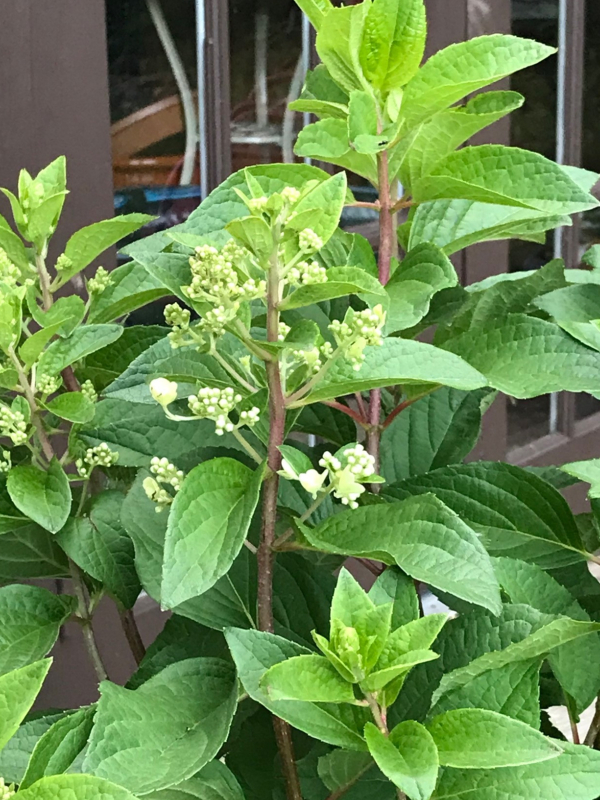 I have not heard of a hydrangea tree, but color me intrigued. I can't wait to see what you do with the interior. I'm not sure I have much planned for the interior, Pattie...at least not yet. It's truly for storage of garden supplies and also for potting up plants. I did try to make it 'cute' for a while, but it works so hard it's usually a mess. Oh well!